A collection of plays for all ages consisting of eleven fun-to-act short plays for all children to enjoy, especially those in primary school (Key Stage 1 and Key Stage 2). Each play comes complete with helpful guidance on target age, running time and cast. 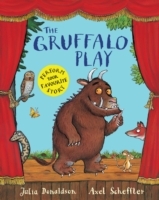 Ranging from adaptations of traditional tales (e.g., the legend of Persephone and The Three Billy Goats Gruff) to original and contemporary short plays, Julia Donaldson has produced an entertaining, simple, satisfying collection.